Although average prices of $600 to $700 per sq. ft. are on the high end, exclusive penthouse suites can run up to $1000 per sq. 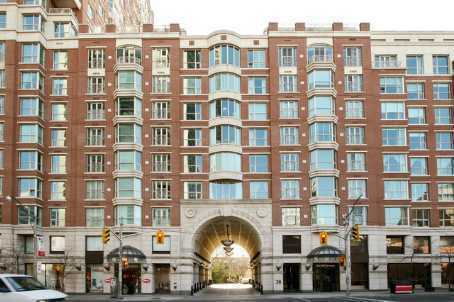 ft. at the prestigious 38 Avenue Road condominium. The prominent three storey arched entrance greet the elite on this west side of Avenue Road. Minto Developments finished the work in 1999. To the north is a terraced courtyard that cascades beautifully from 10 to 6 storeys and on the south of the building is a 24 storey tower with views of the city. The 152 suites are on the larger side from 1000 to 4000 sq. ft. but the more exclusive penthouses highlight the almost 8 foot windows, 10 foot ceilings, and they have direct elevator access. On the 2nd and 10th floors the Yorkville Club offers a great many amenities including a fitness facility, private dining rooms, sun deck, saunas; billiard, card, and multimedia rooms, entertainment facilities, 24 hour concierge service, valet service for residents and their guests, and you’ll always be greeted by a very pleasant doorman.